Description: London, Blackie and Son Limited 1910 by inscription Colour plates (24) by Harry B. Neilson of anthropomorphic animals dressed as humans. . Quarto green pictorial cloth (very worn, water marks & scratched, but covers still attached and keeping the book together) All Edges Gilt. Unpaginated but over 100 pages. Lacks both free endpapers but has half title & titlepage in red and black, some pages may be missing but the 24 colour plates are all present. 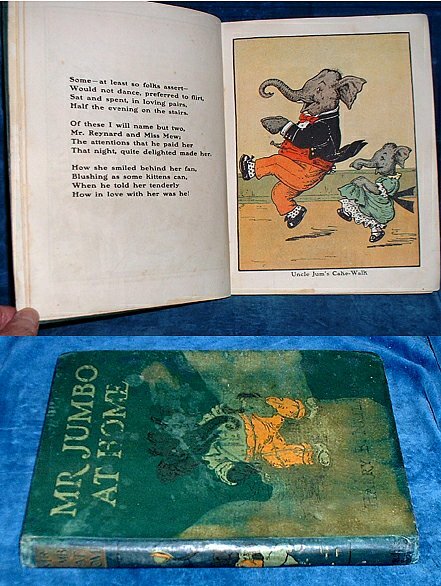 Many b/w illustrations both full page & in-text, all are child-coloured, but colour plates are not affected. Some marginal tears and one text page with a hole less than 1cm missing), some foxing/staining, mainly marginal. The 4 best plates of boxing, bathing from bathing-machines, playing croquet and "Out on the Golf Links" are in the best condition. Gift inscription to Helen Mary Godwin from Mrs. Statler Xmas 1910 and ownership page filled in to Jane Godwin Marston 1941. Poor condition, sold for the plates.